(Geranium, Wild (Geranium maculatum) - 01) We happened on this patch of wild geraniums unexpectedly, as we hadn't noticed any in this area for several years. 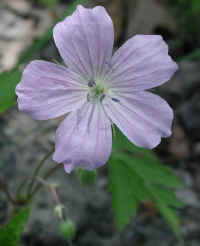 Some of the distinctive characteristics are its five deep-lobed and toothed palmate leaves and five-petal flowers, with ten stamens and one pistil with five styles. 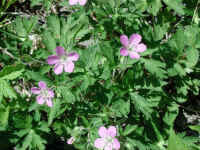 (Geranium, Wild (Geranium maculatum) - 02) The beauty of the wild geranium has a purpose beyond the obvious visual attractiveness to us. The lower petals are covered with pollen and some of the stamens show signs of being rubbed by insects who came in search of the flower's nectar. 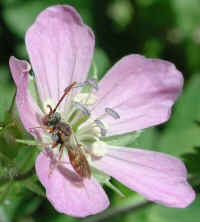 The pollen is then transferred from flower to flower as insects go about their daily activity. This is all part of God's intricate creation. (Geranium, Wild (Geranium maculatum) - 04) The magnificence of God's creation can be seen in this perfect wild geranium flower. We enjoy going out on the lake in our canoe and slowly paddling along the shoreline. In mid-May these flowers shine forth as beacons attracting our attention. 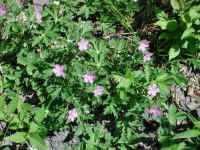 (Geranium, Wild (Geranium maculatum) - 05) We found this clump of wild geraniums on a stone path near the edge of the lake. 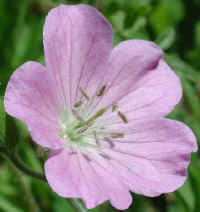 (Geranium, Wild (Geranium maculatum) - 06) In the past several years we have had very few honey bees because of the mite infestation of their hives. 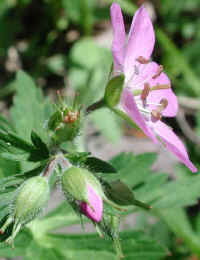 As a result, flowers, like the wild geranium above, have had to rely on other insects for pollination. This small visitor appears to be a Korean digger wasp introduced into this country in order to control the Japanese beetles. 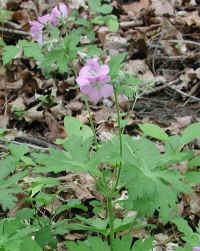 (Geranium, Wild (Geranium maculatum) - 07) We spotted this wild geranium growing on the edge of the woods along the shore of Sleepy Hollow Lake. 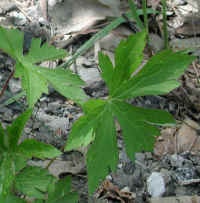 (Geranium, Wild (Geranium maculatum) - 07a) In this photo of the leaves of the wild geranium, we have a closer look at their palmate structure of five deep and coarsely toothed lobes. 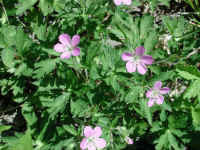 (Geranium, Wild (Geranium maculatum) - 07b) The leaves of the wild geranium grow opposite one another and the flowers grow in a loose corymb. 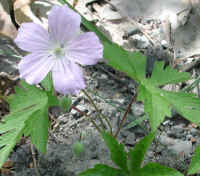 However, we have observed in the spring when they first appear, the long stems on the flowers and leaves look as if they are all growing separately out of the ground. 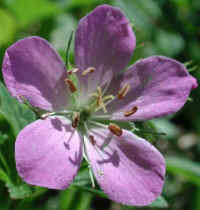 (Geranium, Wild (Geranium maculatum) - 08) This is another look at the 1-1/2 diameter flower of the wild geranium. 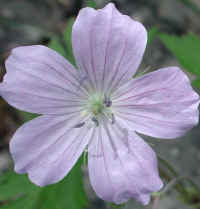 (Geranium, Wild (Geranium maculatum) - 09) In this close up look at a wild geranium flower, we can see the pointed tips of the five styles between each of the five petals. 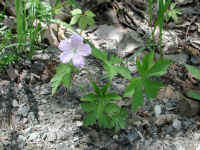 (Geranium, Wild (Geranium maculatum) - 10) This is a small patch of wild geraniums that we spotted growing in the woods just off a dirt path. (Geranium, Wild (Geranium maculatum) - 10a) In this semi-side view of mature wild geraniums, we have a better look at the structure of the loose corymbs growing from atop a main stem from what appears to be the leaf axil.